The iF design award was conferred for the 61th time in February of 2014. 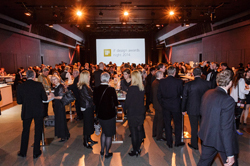 The worldwide recognized design award was celebrated in the Munich BMW World on the 28th of February. Besides the iF communication design award and the iF packaging design award, the third one, the iF product design award was especially focussed. A total of 3,249 presentations of 48 countries were rated for the product design award by an international jury of experts, including Harri Koskinen, Stefan Scholten from Scholten & Baijings as well as Christoph Böninger from Auerberg. In the event of the iF product design award, 1,220 products were honoured, and 50 of them received the highest award, the iF Gold Award. The winners of the iF gold award are, among others, the Leimu and the Vakka from Iittala. The awarded products are presented in the iF design exhibition in Hamburg since the 1st of March. The exhibition in the hanseatic city runs until June 2014 showing the honoured products of the iF packaging design award as well as the iF product design award in the categories audio / video, telecommunications, computer and office / business in their original forms. All the winners of the iF communication design award as well as the category research + development / professional concepts are presented digitally. Besides the current winning products there is more in the exhibition: The digital exhibition in the Arcade Castle invites with its surf tables. Roundabout 80,000 presentations – 33,000 awarded products of the iF design award since 1953 and 45,000 concepts of young newcomer talents – are viewable. One special exposition about the brand Eva Solo is still there until the 31st of March: The multiple awarded Danish company presents high grade home accessories and kitchen dishes in that special exposition. The products represent unique, elegant design, which combines aesthetics, functionality and high quality. Further awarded of the iF product design awards 2014 are here.